Igshaan Adams, Jared Ginsburg, Bronwyn Katz, Donna Kukama, Turiya Magadlela, Sabelo Mlangeni, Kyle Morland, Cinga Samson, Gerda Scheepers, Lerato Shadi and James Webb. Galerie Guido W. Baudach and blank projects are pleased to announce an exhibition of works by South African artists Igshaan Adams, Jared Ginsburg, Bronwyn Katz, Donna Kukama, Turiya Magadlela, Sabelo Mlangeni, Kyle Morland, Cinga Samson, Gerda Scheepers, Lerato Shadi and James Webb. The exhibition arose out of conversations around a gallery swap between Guido Baudach and Jonathan Garnham, who have been friends and colleagues since the ‘90s, which resulted in the invitation to present blank’s programme in Berlin. Curated by Garnham, the exhibition features selected works by represented artists and invited guests, the show offers a vignette of the practices of a group of emerging and established South African artists working today. Igshaan Adams (b.1982, Cape Town) combines aspects of performance, sculpture and installation in an ongoing investigation of his own identity. The quiet activism of Adams’s work speaks to his experiences of racial, religious and sexual liminality, his use of the material and formal iconographies of Islam and South African ‘coloured’ culture allowing him to develop a more equivocal, phenomenological approach towards these concerns and offer a novel, affective view of cultural hybridity. With a practice spanning sculpture, drawing, painting, installation and video, Jared Ginsburg (b.1985, Cape Town) seeks indeterminacy or chance operations in his process, allowing him to be surprised by the results of his actions. Ginsburg’s work is conceptually grounded in the ambiguities of perception, time and materiality, and the difficulties of consolidating these aspects. Incorporating sculpture, installation, video and performance, Bronwyn Katz (b.1993, Kimberley) engages with the concept of land as a repository of memory, reflecting on the notion of place or space as lived experience, and the ability of the land to remember and communicate the memory of its occupation. In her video work Grond Herinnering (2015), Katz reflects on her identity and upbringing, playing childrens’ games and ‘washing’ her feet in the red soil of her hometown “as a way of reminding my feet of where they come from”. The sound accompanying the video is the artist reciting a letter from her grandmother, which recalls memories from Katz’s childhood and other stories. 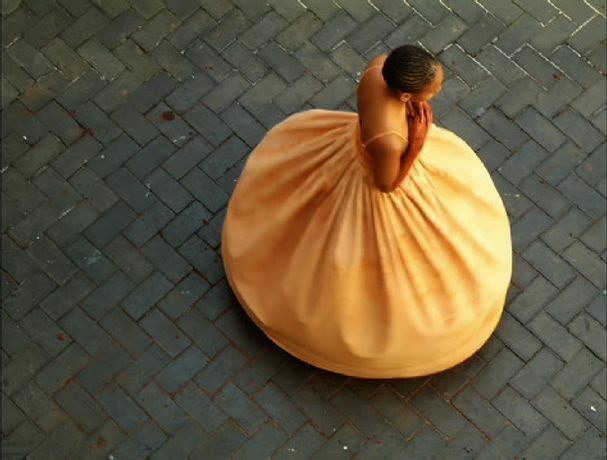 Donna Kukama (b.1981, Mafikeng) is a Johannesburg-based multimedia artist working in video, sound, and performance. Predominantly performance-based, her work often presents itself as moments within reality that question the way in which histories are narrated, as well as how value systems are constructed. Through creating fleeting moments that exist between reality and fiction, her performances manifest through the unscripted participation of others, and often resist established “ways of doing”. Intended as gestures of poetry with political intent, Kukama’s practice is a strategy for inserting a foreign, ‘alien’, voice and presence into various moments in history, as much as in existing territories of the public. The oil paintings of self-taught artist Cinga Samson (b.1986, Cape Town) address themes of youth, masculinity and spirituality against the backdrop of Post-colonialism. According to Samson, his artworks engage with the frustrations of young black Africans and their sense of displacement within the nationalistic narrative of social cohesion. Figurative self-portraits, the works depict the artist posed in front of surreal landscapes - composites of his own fantasies and the scenery of South Africa. The dislocation between subject and background lend the paintings a traditional, almost anachronistic feeling. Empty white eyes gaze out at the viewer – as if they were in fact turned inward – suggesting the preeminence of the interior life of the artist-subject over the external world. Lerato Shadi’s artistic practice explores problematic assumptions projected onto the Black female body and how performance, video and installation can create a space to engage with those preconceived notions, making the body both visible and invisible. Shadi questions how the white cube can be symbolic of spaces of exclusion. How does the location and architecture affect the body that is performing in it? Why is it important to centre - and not just include - the marginalized body as a main figure of narrating experience? Presented as a large-scale wallpaper print, the work is a still from Shadi’s video MATSOGO (2013), in which a pair of hands crumbles a piece of cake and then reshapes it into the same triangle shape that references the beginning slice. Through the process of moving from deconstruction to reconstruction, the essence and consumability of the piece of cake is undermined and lost, as it is recreated into an object, that resembles and has the same elements, as the cake, but has lost its function. Working primarily with commonly found yet conceptually loaded fabrics, from pantyhose to prison uniforms, Turiya Magadlela (b.1978, Johannesburg, South Africa) creates abstract compositions by cutting, stitching, folding and stretching these materials into various permutations. Her subject matter moves between articulations of personal experience of woman- and motherhood, and narratives from Black South African history. The black and white photographs of the Invisible Women (2006) series by Sabelo Mlangeni (b.1980, Driefontein) document the working-class women who clean the streets of Johannesburg by night, but who disappear from the city during the day like ghosts; a strange hangover from the days of Apartheid when black women were barred from entering the city at all. Working across disciplines in sculpture, photography and video, Kyle Morland’s (b.1986, Johannesburg) primary interests lie in forms, the systems that create them, and industrial modes of production. He often sets himself rules, and creates the necessary tools, to realize his ideas which add a set of formal constraints to the creative process and resulting work. James Webb (b.1975, Kimberley) is an interdisciplinary artist whose work ranges from site-specific interventions in public spaces to large-scale installations in galleries and museums. Informed by his studies in advertising, comparative religion and theatre, he often makes use of ellipsis, displacement and détournement to explore the nature of belief, and the dynamics of communication in our contemporary world. Webb’s practice employs a variety of media including audio, installation and text, referencing aspects of the conceptualist and minimalist traditions. The exhibition attempts to weave together the work of artists from eleven distinct positions. The result is a loose topography that reflects on our time and place, with such diverse concerns as memory, the politicised body, the behaviour of materials, and the poetic moment.